Tintin Heart: Digi Scrapbooking and a New Challenge- CG Scrapbook Blog. Digi Scrapbooking and a New Challenge- CG Scrapbook Blog. Today my post is my DT digital scrapbook page for the new challenge starting to day over at the CG Scrapbook Challenge blog . Through my cardmaking I branched out into Paper Scrapbooking, making use of simmilar paper crafting products, just on a larger scale. I'm relatively new to Digital Scrapbooking and I still have a lot to learn, but this learning experience is fun. Our challenge theme is 'PATCHWORK' and runs from today until the 15th October. The challenge is open to both Paper and Digital scrappers and this month we have secured the sponsorship from Crafty-Emblies a super new craft supplier specialising in wooden embellishments. Wondering what Katie will do next. My layout for this DT has been made using a photo of KATIE, my cousins little girl, who is soooo cute in this photo I had to use it just one more time. The page incorporated several kits including the background papers, overlays, frames, transparent embellishments and text. I don't have any specific software especially designed for scrapbooking so I am using Photoshop. Youtube is, for me anyway, a wonderful source of tutorials, hints and tips, and I can follow along with the demonstrations learning how to use the various tools and formats in creating my pages. For anyone new to digital scrapbooking there is also a fabulous array of freebie kits out there which can be used ( subject to the designers policies) to create layouts, with predesigned templates, digital stamps and embellishments. So initially you don't have to invest in a lot of digital kits to get started. Because I love paper and glue and ink so much I cannot see myself going totally digital. Digital Scrapbooking is another string to my crafty bow which I intend to use more often, creating hybrid cards and pages, and maybe have a go a designing some of my own....Let me think on it. Please pop along to the CG Scrapbook Challenge blog and check out the DT work. We have lots of talented scrappers from all over the place, using the traditional scrapbook methods and digital too. The winner of this challenge receives a 10GBP voucher from Crafty-Emblies to be spent in their wonderful on-line shop. Check out the range of fantastic embellishments and fabby new stuff is added almost daily! Thank you for stopping by to visit and reading my blog. Your time and comments are always appreciated. 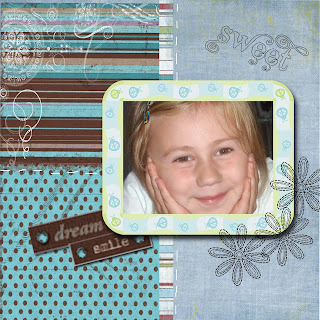 Such a fabulous scrap page Angela...I can see why you used that photo again,she is adorable,I love her expression. Love this, do like the digikit. Well done.